Suffering from flat growth or even stagnation? Wasting time & money on unmeasurable & ineffective marketing efforts? Losing sales by not creating and cultivating relationships with prospects? Solving these problems is easier than you might think. We can show you how. 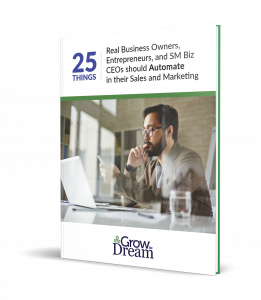 T o help you see what I mean, I'd like to offer you a free copy of our report: 25 Things Real Business Owners, Entrepreneurs, and Small Business CEOs Should Automate in their Sales & Marketing. This report is loaded with tips you can put to use right away in your business. Just 1 or 2 of these ideas could be worth thousands of dollars to your business over the next few months! Simply provide a few details below to get started! What's your biggest struggle with growing your business?